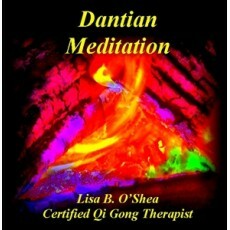 The Dantian Meditation is a powerful and ancient practice that increases longevity and improves constitutional health. The Dantian is our body’s storage battery for energy and is located deep in the abdomen. This meditation will teach you how to deeply relax your body and breathe into the Dantian. Through a variety of beautiful and powerful guided visualizations you will bring universal energy safely into your Dantian for health and longevity. The music on this recording has been specifically written for Qigong meditation. On track 8 you will find a bonus track (30 minutes long) with the music by itself without the guided meditation. Over time, as your expertise with meditation increases, you may want to try an unguided meditation of your own and you may find track 8 of this recording useful for this. Daily meditation is an investment in your future as well as an aid in daily stress reduction. Music written and produced by Lisa B. O’Shea and Susan Amelia Sirianni © 1996, Meditation by Lisa B. O’Shea © 1996. Recorded and mixed at BELIEF Studio. Re-mastered at Georgann John Productions ©2010. All rights reserved.